2nd. Mango Darwinian, -1.955 seconds. 3rd. Blittz Weaver, -6.290 seconds. 4th. Dolli Dreamscape, -7.264 seconds. 5th. Eddie Mathieson, -14.623 seconds. 6th. AdrianaZhay Resident, -19.422 seconds. 7th. eddiemm Resident, -20.600 seconds. 8th. Aaron Lamont, -25.712 seconds. 2nd. Blittz Weaver, -2.981 seconds. 3rd. Aaron Lamont, -7.490 seconds. 4th. Dolli Dreamscape, -10.248 seconds. 5th. Eddie Mathieson, -17.604 seconds. 6th. Mango Darwinian, -23.010 seconds. 7th. eddiemm Resident, -24.337 seconds. 8th. AdrianaZhay Resident, -25.337 seconds. 2nd. 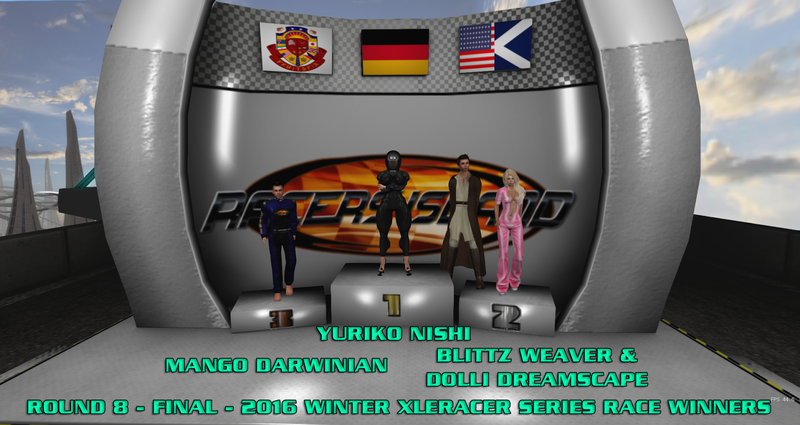 Yuriko Nishi, -1.332 seconds. 3rd. Eddie Mathieson, -9.776 seconds. 4th. Mango Darwinian, -10.689 seconds. 5th. eddiemm Resident, -12.067 seconds. 6th. Blittz Weaver, -15.756 seconds. 7th. AdrianaZhay Resident, -16.269 seconds. 8th. Aaron Lamont, -18.556 seconds. 2nd. Mango Darwinian, -5.488 seconds. 3rd. Dolli Dreamscape, -6.356 seconds. 4th. Yuriko Nishi, -9.112 seconds. 5th. Eddie Mathieson, -11.580 seconds. 6th. Aaron Lamont, -16.778 seconds. 7th. AdrianaZhay Resident, -17.179 seconds. 8th. eddiemm Resident, -38.552 seconds.